Media has always been a fourth pillar of a democratic nation, just like India in this case. Media has been a touchstone of every individual’s life because it is and has undoubtedly been the only source to know what is going on, in any part of the Globe. Media is supposed to cover an incident, bringing forth hitherto unmentioned details or discerning the different threads which went into making the said incidents. There are times when instead of discharging its duty as one of the watchdogs of democracy, media opts to cover the incident in other ways. It comes as a surprise to us that the media is indulging in blatant fabrication of news. Undoubtedly, we all are well aware of the saying that “Beauty lies in the eyes of the beholder”. Loosely interpreted, which means that we may all see things differently and so it is with opinions upon current event, whether or not, they are to do with government actions or any other facet of our daily lives. Commercialization and Privatization, though not the factors to be blamed for such excruciation but it is indeed one of the reasons of unregulated actions and broadcasts by Media. 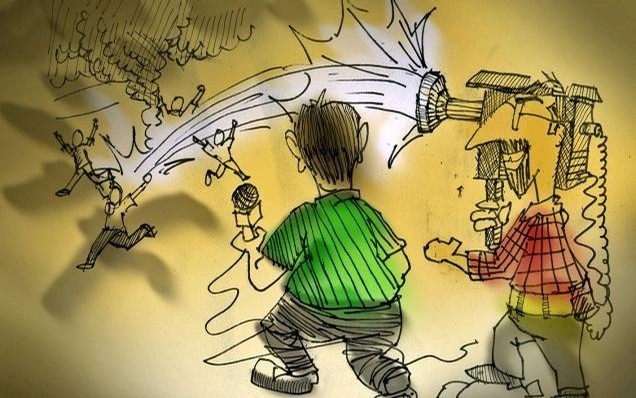 There is less reality more propaganda with their selfish and commercial motive, they turn non-issues into major issues circulating over the news channels and today just like many other several incidences, NALSAR Media wreckage stands testimony to ‘not-at-all-sensitized’ media. In the NALSAR incident, the major question arises upon who gave the media persons the right to police the young students when a proper mechanism is provided by the law. The issue of sensitizing media is not new, but since this time a law student has fallen a prey to such a highly unprofessional and insensitive act of a local media person; the voices are high alarmingly seeking justice with not only remedial measures but also coming up with regulatory interventions of our esteemed legislature bodies. Media is like an un-tamed horse, if kept loose, has enough power to create havoc in society. It is noteworthy that there is no such law criminilising consumption of alcohol at a licensed place, walking outside the college premises late night or say wearing one’s desired clothes and if one is not barred by the law then where does the media stand an appropriate authority to question or to raise concern, that too so insensitively. There has even been violation of section 354D of the IPC under the Criminal Amendment Act 2013 in which stalking or clicking photographs or making video without a women’s consent is an offence, which directly infringes the Art 19 & 21 respectively of the constitution of India. Art 19(1)(a) gives freedom of speech and expression including wearing clothes of one’s choice and freedom of movement subject to the condition that they are not barred by the law and are suitable for the locality where they are born. Hyderabad being a metro city of India has no such law that restricts a woman to wear any particular clothes. But, today’s media plays a large role in dictating what a true women should look like, talk like and who they should be friends with. By in large it has an overwhelmingly negative impact on a women’s self-esteem and her feeling of self-worth.